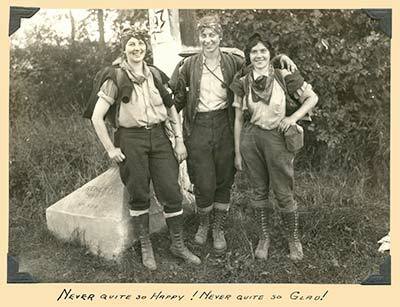 In July of 1927 three women, Catherine Robbins, Hilda Kurth and Kathleen Norris ventured off to spend their summer vacation hiking Vermont’s 272-mile Long Trail. They became the first ever-documented women to complete the Long Trail hike, something conventional wisdom in the 1920s insisted women couldn't do. One of the best things they did on the trail was rest. When their spirits were low, they’d stop hiking, pull out the 2 lb. Ukulele they carried and sing college prep songs until their energy was recharged enough to hike on. They never believed in "signs", and repeatedly referred to the 1927 Green Mountain Club Guide Book to verify the Long Trails location to keep them on course to Canada. After trekking the entire Long Trail, The Three Musketeers head up and over Jay Peak to Troy, Vermont where they stepped on the Canadian line on August 25, 1927. But this time The Three Musketeers appeared as young women instead of the swashbuckling heroes of the Dumas novel. The three young women in question were Kathleen Norris, and Hilda Kurth of Schenectady, NY, and Catherine Robbins of Cornwall, VT. As they traversed the Long Trail over the Green Mountains of Vermont their hike became media frenzy coast-to-coast, and they were hailed as “The Three Musketeers”. They unknowingly became the first women to complete the 272-mile hike over the Long Trail from Williamstown, MA to the Canadian border — a stunt they said women could not do. 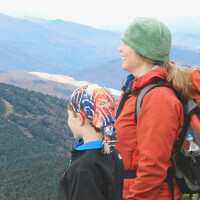 This extraordinary summer vacation gave The Three Musketeer’s numerous thrills in Vermont’s wilderness with the benefits of exercise and being in the outdoors. They aspired many more women and families to do the same. Come explore and learn how this historical pioneering hike and heroic journey put this country’s oldest long distance hiking trail on the map to success. 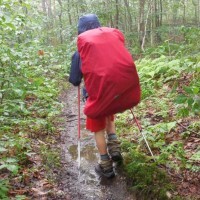 Learn about backpacking, how the Long Trail is maintained by the Green Mountain Club and become the next generation of Musketeers to continue living the legacy. 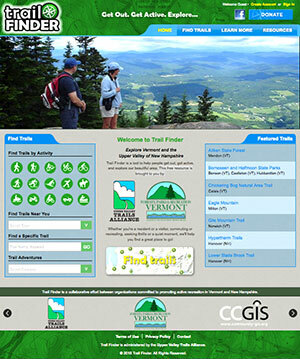 Truly grasp how to enjoy Vermont’s footpath in the wilderness, and engage in your own adventurous hiking lifestyle.